The monthly boxes are themed around a producer who specializes in a particular style of cured meats. For example, French Charcuterie, Spanish Chorizo, or even South African Biltong. Carnivore Club makes an effort to use only artisans who “purchase ethically treated animals, employ humane slaughtering practices, use locally sourced ingredients and have a passion for making exceptional products.” This ties Carnivore Club to several other monthly subscription box clubs in that they try to practice sustainable, philanthropic, or animal-friendly business habits. Frankly, it makes it easier to type in the old credit card number when you respect the company for the mark it leaves on the world. The club offers three subscription plans: monthly, bi-monthly, and quarterly. 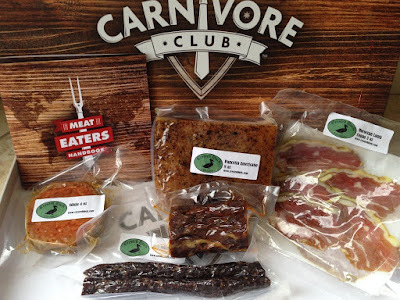 It is also possible to buy a trial, one-month membership for an additional $5 to try things out.A final word from Carnivore Club…The cured meats can last on the shelf for at least a month, but they recommend refrigerating their products to maintain the highest quality for its consumers. A quick poke around the internet reveals mostly positive reviews, which include praise for the products as well as kudos for the entire presentation. I think these reviews can be taken at face value because somebody who would subscribe to a monthly delivery of fine cured meats probably knows something about this type of delicacy. The fact that the meats are highly regarded says a lot. But, it’s always best to give these things a shot for ourselves, isn’t it? My first monthly subscription delivery ($50) arrived in a cool cardboard box, decorated to look like a cutting board. Inside, the meats were individually wrapped, and a brochure introducing this month’s supplier sat on top. The brochure also included information about the different meats included. My box was supplied by Charlito’s Cocina, producer of fine Spanish cured meats. Carnivore Club also included some hints as to how to couple the meats with appropriate cheeses. The first cured meat selection I tried was Chorizo Seco ($18 purchased individually), which is made with pork and seasoned with sea salt, paprika, and garlic. The texture of the product is sensational. I thought the flavor was above-average at best, and I willingly admit that is probably as personal palate thing. I would eat it again, but I might not go out of my way to do so. Next, I tried the Cerveza Seca ($18). This selection is dry cured with fermented brown ale and seasoned with fleur de sel. I really enjoyed this cured meat. The beer added something both unique and familiar to the flavor. I would gladly eat the Cerveza Seca again.The third cured meat product I tried was the Salami Picante ($18). It is also dry cured, but this time with chiles, which provide a zap of heat. I also liked this selection, but the spices would limit my consumption to every once in a while. Finally, the most expensive ($20) of the four cured meats from Charlito’s Cocina was the Trufa Seca. This is also dry cured, and the sausage is not smoked. It also gains the deep, almost earthy flavor from the black truffles and sea salt used to make it. I have no doubt that this selection is well done, but I do not like truffles, so the greatness was lost on me. Overall, I give Carnivore Club a positive rating, but not a raving review by any means. I think the products are high-quality, and the presentation is top-notch. But even at a reasonable $50 a month (total value was $74), do I need four artisan cured meats around the house? Especially given the chance that I might not care for the ingredients or flavors of some of the products. But again, still a modest thumbs up for Carnivore Club (www.carnivore.co) for delivering a high-quality product at a reasonable price.